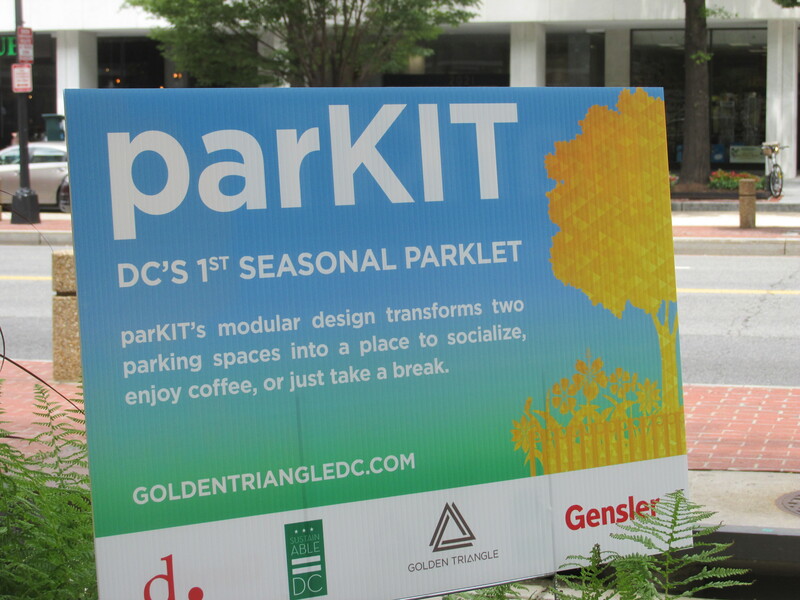 New Seasonal Park on K Street — Could this Work on Georgia Avenue? | Park View, D.C. This entry was posted on July 16, 2015 at 7:01 am and is filed under Streets and Trees, streetscape. You can subscribe via RSS 2.0 feed to this post's comments. I really think this would be of great benefit to our Lower Georgia Avenue businesses. I’ve often walked past the 3600 Georgia Avenue area, and it seems to be thriving and have wide sidewalks in some aspects. The sidewalks of Lower Georgia Avenue are significantly narrower- and leaves so much more to be desired. We are absolutely craving something like this in our area. Outside my business, I’ve often said that I’ve wanted to have bicycle parking. Our fitness studios have people coming all the time with bikes, and we simply have no place for bicycles to park their bikes. Members resort to locking them to posts, parking meters, trees, or asking to leave them in our studios. We’re wheeling bikes into our back areas and through the pilates reformer room- not fun! If we had something like this, outside my studios, I think not only would our members benefit from this, but the community in the area that we serve. The spaces that are the free parking outside my studios- those should remain free (for instance, there are charity groups next door to me, and they would appreciate maintaining the free spaces)… but there are two parking meters just behind those free spaces that would be of great benefit to change over to this parklet. There is a huge tree that would provide plenty of shade for the parklet. And- myself and my staff would be happy to help maintain it as well if it were placed there. Oh- activities to support- I would be totally willing to do micro-community classes with my friends at Bikram Yoga Petworth. We could arrange a schedule and post them. And- I’m sure some of our friends on the block could provide smoothie sample or coffee samplers. Just a thought. This is a great idea. Would love to see a bike corral outside of DC Reynolds as well. Im sure there would be support from Looking Glass/Walters folks as well. 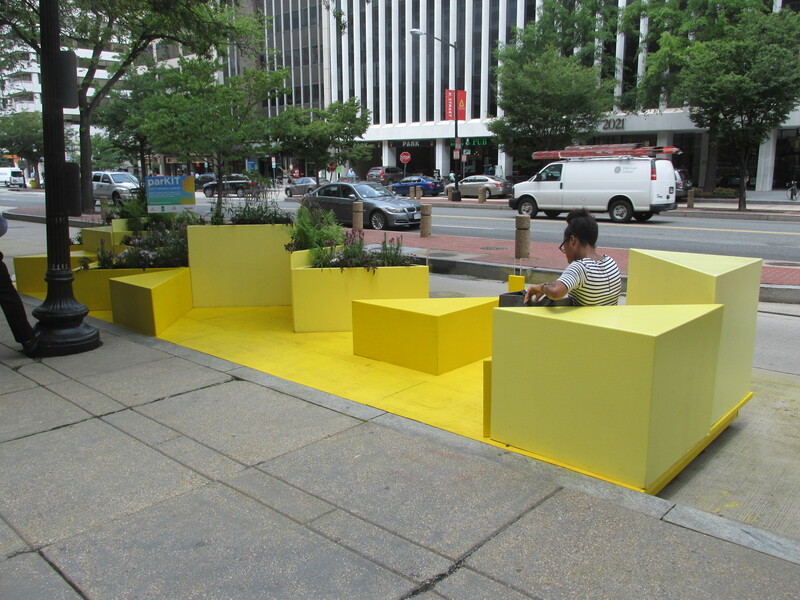 Why not just focus on permanently expanding sidewalk space on Georgia Ave? It would really help beautify this corridor and help the businesses. Maybe the businesses should lobby the council? I think this is an excellent idea. GA is really lacking the warm inviting feeling that invites people to congregate (outside of alcohol drinking and drug dealing). I agree the bike rack (similar to how it’s done on 11th st would be great! Your proposed spot is probably the most logical given the businesses. I would also propose discussing this with the developer who owns the lots on both corners of GA and Morton. There is a significant space with the parking lots to do something like this and incorporate it with the ground floor businesses. Just a thought. Absolutely! The drunks and drug addicts on GA avenue need a comfortable place to congregate and rest. There is a possibility of it being taken over by them and therefore not serving the intended purpose to be enjoyed by everyone. That should be considered.